What if the celebrations of Noruz and, say, Ashura coincided in a providential year? What if the solar cycle of life concurred with the lunar one, the sun-struck with the lunatic? What would happen if hot and cold came to mix on a social scale? This is the situation that the successful play by Mohammad Rahmanian sets out to stage and explore. "MAJLES NAMEH starts with a very simple premise," says the playwright, "that [traditional] Iranian comedies and tragedies have a common mainspring, and even now we can see in many of these plays the elements of mirth and grief at the same time." The story is straightforward. The king has died. There is a struggle between his two sons to take his seat. The older son naturally stands to inherit the throne, and the younger has his eyes on the prize. The court is divided. The many wives of the respective heirs are alternately jubilant and aggrieved, showing their emotional state by wearing colorful and dark colors respectively. The wives of the older son want to celebrate their imminent rise in status, while the wives of the younger are unhappy about the status quo. In the middle is the traditional court jester, the black minstrel, Firouz, who plays the unconventional role of mediating the two sides. On the one hand, a ru-howzi entertainment is called for by the jubilant crowd, and on the other a shabih-khani is to be arranged for the black clad wives. Firouz, who has traditionally played to the tune of laughter and merriment, with a tinge of wise parody, is transformed into a "narrative catalyst" that makes possible the transition from one ceremony to another. He is now the wise narrator, who brings out, in a reflexive manner, the political reading of the situation. He is looking at the court debacle not the way traditional Firouz would have looked at it (using shticks or comic routines to outsmart the greedy man in power), but as a deep thinker who sees beyond petty skirmishes. In the middle of the confusion that reigns the stage, news comes that the older son has fallen ill, perhaps due to some form of poisoning administered by the wicked vizier who wants to take charge of the affair to his own end. The cycle of merriment and lamentation reverses. Those in mirth have shed their attires for dark clothing and visa versa. It is here that the intention of the author/director comes out best: our moments of sorrow and felicity are infinitely close and reversible. On a social scale, these moments are political fodder -- wail or hail -- for the powerful to make use of. MAJLES NAMEH plays with the two seemingly contradictory situations so well that the spectator does not sense the unusual admixture of different genres. 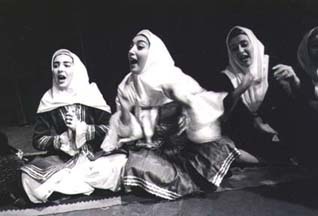 Many stage directors have tried their hands at traditional form of dramatic arts (Davood Mirbaqeri, Siavosh Tahmoures, Ali Nassirian, among others) be it religious epic theater or burlesque, but none have been as successful in using the traditional vehicles to such an effective and wholly original end. What are the elements that make MAJLES NAMEH a successful play? Is it an instinctive understanding of the play's traditional engines? The script itself and the choice of dialogue? Or, the rhythm and beat that pervades the stage? MAJLES NAMEH succeeds on many different levels. According to playwright Hamid Amjad, it is not enough for the writer to have lived and grasped the sense of traditional genres of performance to reach a modern audience, or to stage an effective play. "Contrary to the conventional understandingt, in order to revive traditional performance it is not at all enough to have an instinctual understanding of tradition," notes the promising playwright in the brochure. "It is of course necessary, first and foremost, that the traditional play be kept alive, and, for that, passion, enthusiasm and the traditional instinct is an imperative; but, all this shouldn't keep us from reminding ourselves that the true life of the performance - any genre or form of performance - can only be achieved by renewal and currency." Amjad quickly points out that this doesn't mean that modern topics or themes must be injected into the body of traditional plays, but that to renew the traditional plays one must start by reconstituting the form. Amjad finds MAJLES NAMEH a veritable example of a new perspective on traditional forms, as well as 1) a powerful expressive vehicle to carry across difficult themes, 2) a superb directorial capability that makes the spectator forget the passage of time, and, 3) a bringing together of many elements of performance, including the mesmerizing parade of colors and the rhythmic dance of music. Ali Omrani, the actor who plays Ghorab-e Shemr in the play, feels that not even one word can be misplaced without damaging the rhythm of the play - such is the precision of Rahmanian's writing: "One of the attractions of MAJLES NAMEH for me is precisely this quality, namely, that the dialogue, the story, the performers have fused together so well that the elimination of any aspect of this structure will lead to the collapse of the whole. And this, to me, is remarkable." He dds, "The performance is comprised of slow narrative moments (traditional dialogue routines between the Haji and the Siah - dialogue routines between Shemr and Sorkhak [the first of the Shabih Khani and the second of Ru-howzi]) and fast, non-narrative moments (the eyeball to eyeball confrontation between the wives of the two sons) in set metric intervals in which the Siah appears as a spontaneous, and post-modern narrator, storyteller (naqal), and the agent of the play at the same time." Combining traditional forms of theater is not a unique experience. It was experimented with before the Revolution (notably, "The Binding Of The Thumb Of Demon") and many "modernized" attempts during the 11-year old Shiraz Art Festival (by director Mohammad Baqer Ghaffari, in 1977-78). Nor have the art forms been wholly ignored after the Iranian Revolution of 1979. Successful playwrights (recently Davood Mirbaqeri's DANDOON TALA, Ali Nassirian's SOLTAN O-SIAH, Mohammad Charmshir's SIAVOSH KHANI, and Pari Saberi's ROSTAM O-SOHRAB) have employed different genres to communicate sometimes surprisingly sharp political commentary. But MAJLES NAMEH has achieved where others have simply imitated, namely, to create a new form of expression. It has redefined all the traditional roles on stage to differing ends. The Siah of MAJLES NAMEH is ultimately not the comic persona that springtime audiences are used to see or hear. Firouz, according to Hamid Amjad, is only too aware of his fate as a performer in the court of the dominant classes. He is aware that the life of drama is subject to torrential modulations under tyranny and terror. "That is why this 'siah' is so different from others," says Amjad of Rahmanian, who was ostracized for eleven years before being allowed to stage his performances. "He is Rahmanian's dark interpretation of the eternal destiny of the artist in the history of this land." MAJLES NAMEH was performed in the small Salon-e Chahar-sou auditorium to sold-out spectators in the last six months.